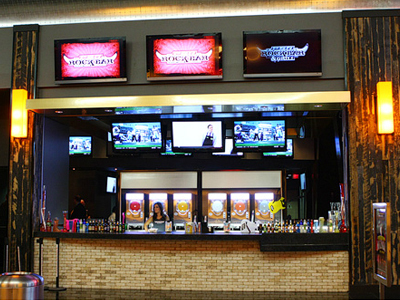 Grab the bull by the horns at PBR Rock Bar & Grill in the Miracle Mile Shops at Planet Hollywood. Imbibe in plenty of liquid libations and take a ride on the mechanical bull available for your riding pleasure. Couple this with tremendous flavors of all-American food served in a rock ‘n roll atmosphere. Taste the bold flavors of grilled burgers, sandwiches, fries and all the fixin’s. You will be surprised and delighted with this lively eatery where you can watch sports, listen to music and enjoy a bull ridin’ adventure. Check their website for daily specials, events and DJ appearances. Wait staff was horrible! Food was ok, I ordered the blackened chicken fettuccine and it was very spicy, I couldn’t even eat it! I tried to wave down our waiter for 15 minutes until he finally came over and told him I couldn’t eat it, he sent the manager over and I told him what happened he was very nice and took it off my bill, by this time I had waited so long I didn’t even want to order something else! Don’t waste your time or your money!! Best place I are in Vegas. Food great as well as service. I can’t judge the entire waitstaff but our particular waitress (can’t remember her name) was very inattentive. Very loud atmosphere…food was ok. Fried pickles were great!! Fun Place, but wait staff was terrible.